Before we tell you about Miss Ellie, we need to tell you about a wonderful little place of peace and memory that was built in 1946 on a 20-acre farm south of Kansas City, Missouri. Wayside Waif's Top of the World Cemetery was founded as a place where beloved animal companions could be laid to rest. Years later, it was enlarged and renamed the Wayside Waifs Pet Memorial Park. Over 12,000 pets are interred here, making it one of the largest pet cemeteries in the United States. Both Ryker and his older brother Caleb are here, as are the companions of several friends we know. It is a place of serenity and reflection. Wayside's adjacent Pet Memorial Services building is run by a staff of compassionate people who understand the pain of loss and who see it on a daily basis. But the most amazing aspect to Wayside's Pet Memorial Services isn't found in its peaceful beauty nor its sympathetic staff, nor its comforting chapel. 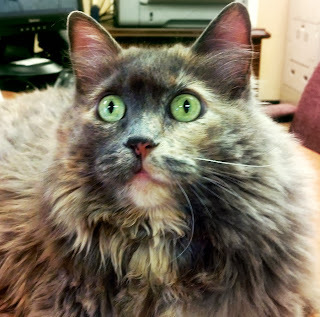 You see it in the soulful green eyes of a medium-haired dilute calico by the name of Miss Ellie. 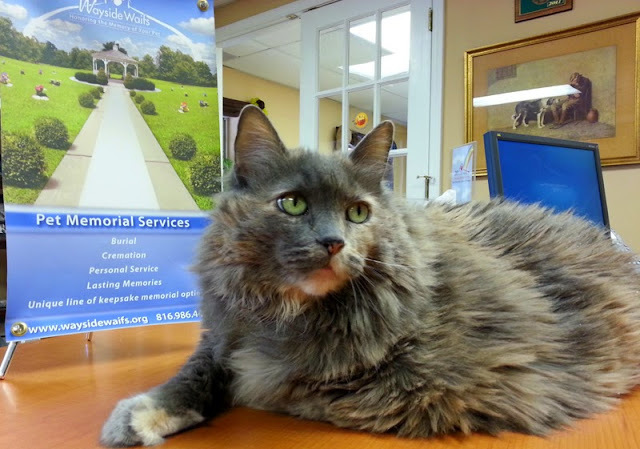 Miss Ellie is a full-time employee at Wayside Memorial Services. She is their Comfort Cat. Where to begin when describing Miss Ellie? She is patient, she is affectionate. She is fearless where strangers are concerned. She has been known to walk slowly and deliberately up to a grieving person and jump onto the empty seat next to them. After assessing the situation with wise green eyes, she'd settle onto the table facing the one who has lost their companion as if to say, "I feel your pain and I'm here for you." When people come in, invariably she is there with her soothing ways. The memorial chapel was filled to overflowing with family and friends. And one lonely little boy, seated in the front row. He sat, desperately trying to grasp why he would never see his best buddy, his furry companion, ever again. Amidst all this walked Miss Ellie. She sedately picked her way through the crowd of strangers, walked up the center aisle and jumped up into the young boy's lap. She stayed with him through it all. Some animals just have that sense, that compassion. Miss Ellie is one of them. There is just something about Miss Ellie. You find yourself burying your hands in her fur as she purrs and kneads, and suddenly the pain isn't quite so insurmountable. Yes, Miss Ellie is a full-time Wayside employee - but she loves her work, and Wayside Memorial Services is fortunate to have her. Did you know that yesterday was National Pet Memorial Day? The day was established over 40 years ago by a nonprofit organization dedicated to the afterlife care of our pets, the International Association Of Pet Cemeteries & Crematories. This post was inspired both by the day of recognition and by our desire to recognize the much-valued work of service animals the world over. merci de faire découvrir ce lieu de sérénité, hommage aux animaux qui ont accompagné nos vies. Miss Ellie is just fabulous. Bless her. Have a marvellous Monday. It looks really nice at the Peaceful Meadow ! We did know and we left our tribute to Abby on their website. It's the second Sunday of every September we learned we hope to remember every year. That place looks serene. Miss ellie sure looks like an expert on comforting humans. She's looks very calm and caring. Wow, Miss Ellie sounds like an amazing staff for the Wayside Waifs Pet Memorial Park. It's great that some cats truly have the compassion for others. This is simply WONDERFUL. Thanks for such a nice Post! OMC...*leaky but happy eyes* Miss Ellie and Wayside Waifs are so amazing. Sometimes loves means just sitting close and being there, wif a little purrr added in. Tank yoo. What a special kitty Miss Ellie is. The Pet Cemetery looks very peaceful. What a special kitty - thanks for sharing her with us. Miss Ellie is an amazing and very special kitty. What a beautiful post. It made me tear up, for sure. We are thankful for Top of the World Cemetery, and especially for Miss Ellie. Miss Ellie sounds like a special kitty indeed, to help so many people who need her. What a cool place and Miss Ellie sounds very special. Mom and Dad are going to be in KC in April for his class reunion and we should check it out. Some beings' purpose in life is clearer than others. With Miss Ellie, it is obviosu her purpose is very clear and that she is very much loved and appreciated as she moves through it. Thanks for letting us know about this pet cemetery , it gives us hope that one day there will be more like it in the world. That is a great job that she has but it must not be easy. But we see Miss Ellie is a purrfect employee and does a great job. This is a beautiful story, thanks for sharing. Oh this just warms our hearts. Miss Ellie, you are an angel of comfort. What a wonderful story....Miss Ellie has the perfect job for a sweet and sensitive kitty; bringing comfort to those who need it most. "Comfort Kitty" - I love that title and Miss Ellie sounds like she loves her work as much as those who meet her FEEL her love when they need it the most. Miss Ellie is a very special kitty! Miss Ellie is a lovely and special cat. Wow, that is very powerful. What a special Ladycat she is. Beautiful post. That is a very sweet and devoted cat!